BSNL Junior Engineer (JE) Recruitment 2016 – Apply Online for TTA (Telecom Technical Assistant) Vacancies: BSNL JE/ TTA Notification Recruitment announced. The Bharat Sanchar Nigam Limited (BSNL) has issued a recruitment notification for conducting a Combined Competitive Online Examination for recruitment to the posts of 2700 Junior Engineers (Telecom Technical Assistant) in every state of India. BSNL JE Online Application started. Age Limit: Candidates upper age limit should be between 18 years to 30 years as on 10-08-2016. Age relaxation will be applicable as per rules. Educational Qualification: Candidates should possess the qualification of 3 year engineering diploma OR BTech OR BE in Telecommunications, Electronics, Electrical, Radio, Computer, Instrumentation, IT OR BSc/ MSc (electronics) OR BSc (computer science). Candidates selected for appointment as Junior Engineer (JE) will have to sign bond agreeing to serve the company for 2 years. Application Fee: General/ OBC candidates are required to pay Rs. 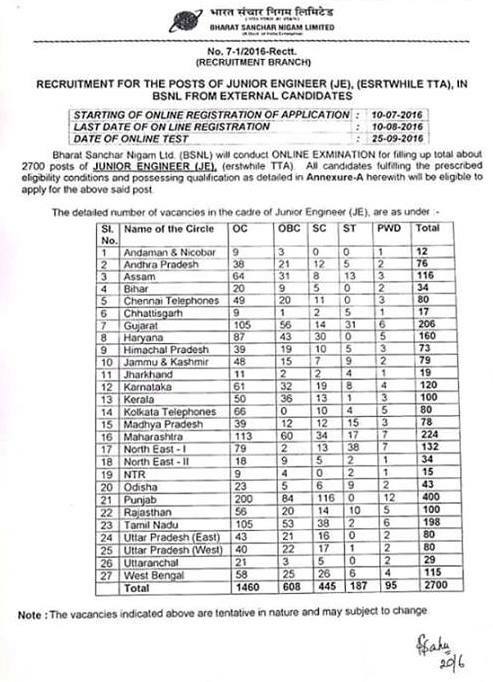 1000 while SC/ ST and other reserved category candidates will have to pay Rs. 500/- as application fee. Application fee should be paid through online mode only using Debit Card/ Credit card, Internet Banking etc. Mode of Selection: Eligible candidates will be selected on the basis of their performance in online written examination. Pay Scale: Rs.13600/- to Rs.25,420/- with Grade pay. A total salary would be approx Rs.30 - 35,000 /month excluding perks, medical benefits etc. Refer to notification for more details. How to Apply Online: Eligible candidates those who wish to Apply Online for Junior Engineer (JE/ TTA) posts in Bharat Sanchar Nigam Ltd (BSNL), they are required to apply through online mode on its official website at www.bsnl.co.in from 10th July to 10th August 2016. More Details: If you want more information about BSNL Junior Engineer (JE/ TTA) recruitment, read official notification followed by the link given below.